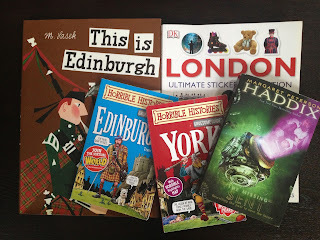 Before our adventure this summer I was on the hunt for some children's books about our destinations and not having much luck. Most of the selections were either too young or too old, and it was hard to find something that struck the right balance between entertainment and engaging history lessons. The talented illustrator Miroslav Sasek has a very charming This is. . . book series, all written in the 1960s. There are 18 books illustrating some great cities, such as New York, Venice, Israel, and more. The drawings of the iconic landmarks are beautifully done and timeless, so we picked up This is London and This is Edinburgh to prepare the boys for some of the sights. Little C&G found the Dodsworth book series at the library and the story about Dodsworth and his duck getting lost around London was perfect for him. Dodsworth in London is geared for the K-2 set and there's also a Paris, New York, and Tokyo version for your little travelers. Big C&G had just started reading the Missing series by Margaret Peterson Haddix and the second book Sent centers around the mystery of the missing princes who disappeared from the Tower of London in the mid 1400s. History really came to life for him as he brought it to London and read it right before our visit to the Tower of London. I hit the jackpot for both boys while touring the Tower of London gift shop. Horrible Histories is a wildly successful British tv show and book series over in the UK, but of course on this side of the pond I'd never heard of it. 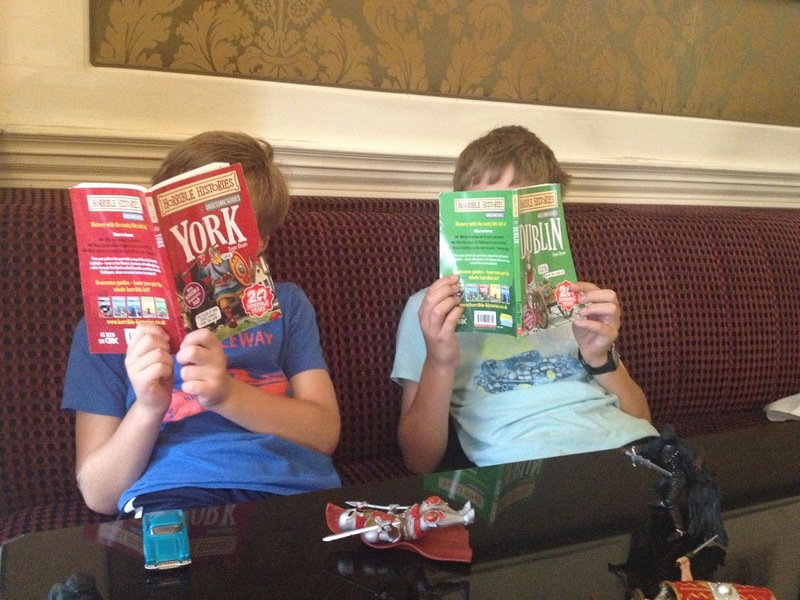 Their Gruesome Guides tell the stories of various cities in a way that 8 and 11 year old boys truly want to hear. It's all about beheadings, plagues, blood, guts, wars, and of course plenty of toilet humor. Because Medieval Europe was never known for its sanitary conditions. I bought them the London, York, Edinburgh, and Dublin guides and the boys had their noses buried in them for a full three straight weeks. They were more than happy to fill us in on the bloody histories as we ate lunch along the River Thames, toured the ancient walls of York, climbed to the top of Edinburgh Castle, and we finally learned what happened to poor Molly Malone on the streets of Dublin's fair city. Alive, alive, oh.